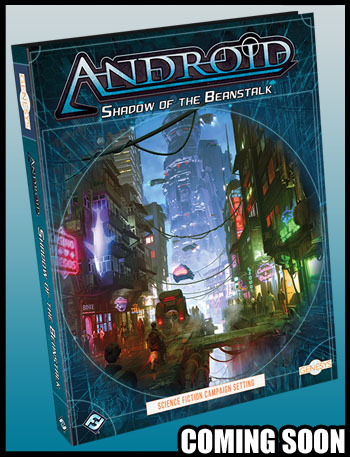 Fantasy Flight Games announced Android Shadow of the Beanstalk, bringing full support of the Genesys RPG to the cyberpunk near future Android universe. The 256 page book features Android specific elements for Genesys character creation and source material complete with game stats. It covers New Angeles, the space elevator known as the Beanstalk, the moon, and beyond. Shadow of the Beanstalk works with the existing Worlds of Android guide book (which is basically a sourcebook sans stats). I worked on Shadow of the Beanstalk.